Welcome to a small portion of the inside of my head, where my cat snuggles up close and the moon is never far away, and I am as magical as the things I dream about when no one is looking. This is the first in my Witch, Cat, Moon series, in which I will appear wearing this dress and this hat and these boots, accompanied always by my cat (The Sergeant, if you please, Pepper if you don't) and the moon in one way or another. It is also the first photo shoot that took place on our five-hour photo-marathon. Can you keep a secret? I've been a little bit scared to start this series, as most of the images I have stacked up in jars in my head, waiting to be poured out into the world, include the entirety of my body and a body is a scary thing. I was fully expecting to hate this image, to not be able to coax it out the way I had envisioned but as soon as I saw the shot in the back of my camera, taken after I'd finally found a comfortable position in the chair and had managed to regain the poise in my expression after watching Sparrow scramble back through the window so that our multitude of candles didn't set off the smoke alarm, that I thought it might just work. The set was dressed by the incomparable Sparrow, who always inexplicably knows exactly how I see things in my head and is somehow able to bring them to life. Even when I've not yet mentioned them to her. (She's a witch too, I'm sure.) 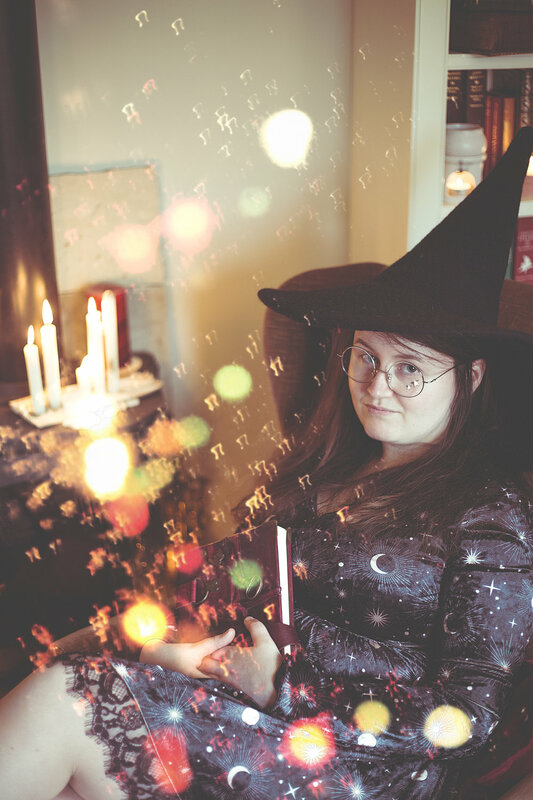 She wanted me to be a witch in her study without my having told her about the Witch, Cat, Moon ideas, I am almost certain that our minds are connected by a fine silvery cord which tingles whenever one of us has a vision that requires the other. I thank her again for the portraits below, and for her knowledge of the angles that make me most happy. While we were magicking these images into existence Wren was flitting around with my second camera, capturing the images that I never get to see from the outside. The behind-the-scenes this-is-how-it-happens images, and the expressions I never knew I had - some of which I might share in a later entry but for this one, I wanted to protect the magic for it is fragile and beautiful and exactly how I imagined it would be.